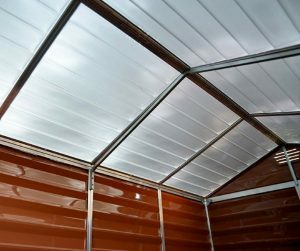 Palram’s groundbreaking designs of cheap plastic sheds – UK constitute a single skin of polycarbonate secured around an aluminium supported framework to determine their low-cost price. 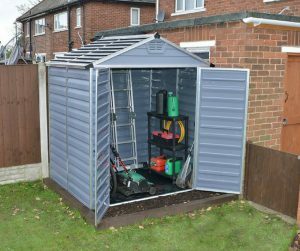 Although innovative in terms of a revolutionary garden shed manufacture, an outpouring of feedback expresses rather a mixed bag of assessments derived from a deluge of purchases. Ranging from ‘5 star super status’ to ‘not worth the money’ represents their 50/50 split. Similar to Marmite, you either love ’em or hate ’em. What Palram does offer however is an inexpensive outside storage solution that economically satisfies the most reasonable of budgets. It’s imperative to accept a single skinned body of poly-carbonate is ultra lightweight and very wobbly to assemble, nonetheless once the flimsy sheets secure to the aluminium frame, sturdiness materialises. Produced in quite a diverse spread of colour-shades including amber, grey, green and brown, their appearances furnish most home-yards with appealing style. A first-glance determines whether or not polycarbonate gratifies your style & services. 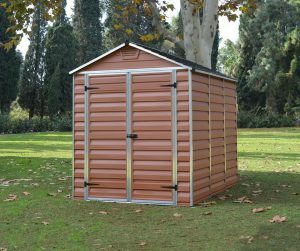 Most low-maintenance shed hunters favour a more robust chunkier-wall construction expressed in the mould of Keter’s Factor make-up which presently dominates the budget storehouse market by combining durability with fair value for money. Upon comparison however, Palram have intensified the competition into an entirely different league with polycarbonate. It’s half the price, classed as inexpensive, robust & ever-enduring. Shed Sizes explores various resin manufactures competing with Palram’s design. You can hammer the heck out of polycarbonate, the composition’s shatterproof and not susceptible to fractures. Palram’s video below demonstrates how this unbreakable make-up resists high impact forces. However, questions do arise whether it’s possible to simply slit through the fascia with a Stanley knife; this material is thin, lightweight & flexible. Richly colourful fascias like these are usually vulnerable to the aftereffects of sunburn whereby fractures occur and bleaching perishes the pigments leading to an unappealing presence. Conquering these dilemmas, the polycarbonate is UV stabilised to endure sun-ray pressures and effectively remain unresponsive. Poly-carbonate’s hard-wearing credentials deliver a win-win situation in terms of imperishability & low-maintenance. Being impervious to rainfall, UV protected and immune from rot deterioration when under the influence of weather aggression, delivers long-term decay-resistance for all seasons. Once the colour tints and protective elements are added to the poly-carbonate, Palram’s molding procedure shapes the fascia into a deep angular horizontal panelled formation, producing a superlative draining surface. Benefiting through an easy-to-clean surface delivers maintenance-convenience, accomplished by an expeditious wash-down with a garden’s shower-hose, a simple method we find revives the shine lickety-split. 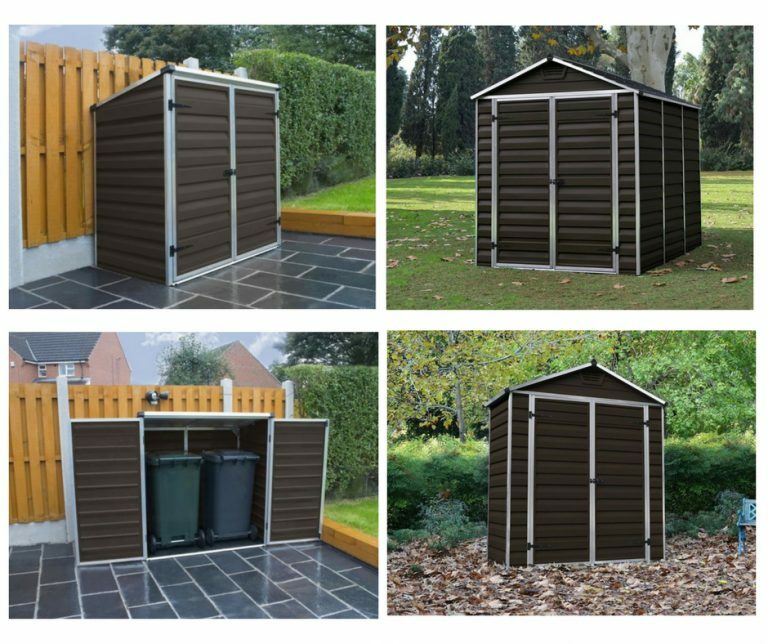 Palram’s shed dimensions range from the smallest utility termed Voyager, designed to conceal wheelie refuse bins; a narrow 4 ft wide by 6 ft length to accommodate tight spots further to an assortment of 6 feet wide units extending from a slim 3 ft depth up to 12 feet in length meanwhile more spacious models are being introduced. Palram’s revolutionary roof design transforms polycarbonate’s singular walled structure to resemble an opaque slated roof on the external side whereas inside embodies an entire skylight arrangement, delivering oceans of daylight to the interior. 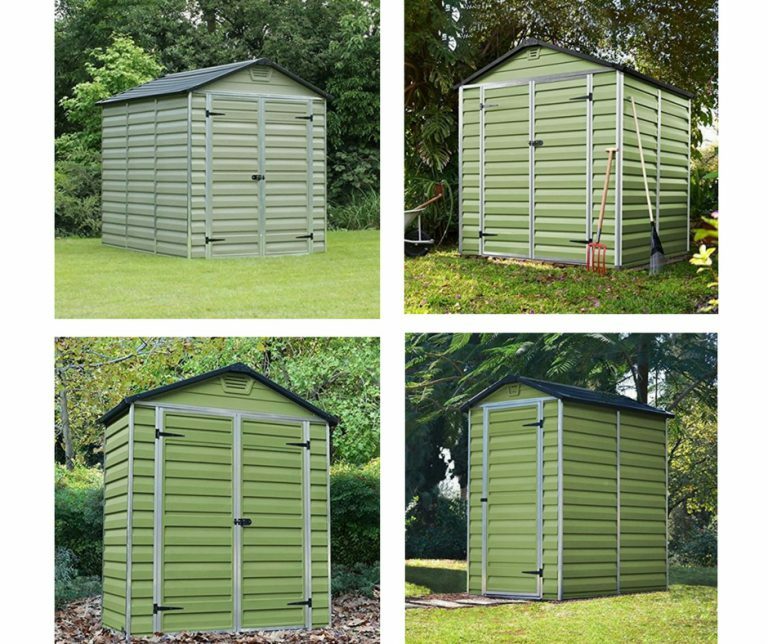 These are undoubtedly the brightest internal sheds during daylight hours. 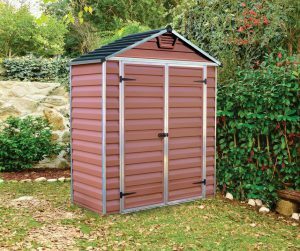 A windowless shed delivers more sturdiness to the construction which is crucial for single shelled facilities like these besides providing complete privacy, hugely beneficial for gardening utility services and general storage as opposed to the openness of being able to see in. The roof structure incorporates a central ridge beam extending the full length of the shed to where the roof framework connects. The roof panels simply slide and secure into the rust-resistant aluminium framing grooves during installation. The roof’s impermeable composition and slanted pitch delivers a satisfactory down-slope for instant rainfall drainage whilst the panels slight overhang of the wall edges overcomes internal leaks due to the fascia-walls connecting underneath. Each shed integrates air-vents into the front & rear triangular sections of the apex peaks. Facing each other they generate fresh-air to circulate inside to forestall clammy environments & condensation developing, hugely significant during summer months to safeguard sheltered accommodation. The floor contains a perimeter groove to which the wall panels adjoin, boxing-in the shed from the outside elements for the purpose of accomplishing a stay-dry leaf-free interior. Manufactured with a fairly thin resin bed upon comparison to the opposition, it’s particularly important a flat solid substrate lays below as crevices underneath will reduce robustness. At certain placements situated around the base edges, clamping positions require bolting down grounding screws to attain rigidly anchoring the aluminium fame & base onto solid ground below. Wheeling lawnmowers inside is aided by a sloping threshold, the door’s opening is operated by two metal hinges whilst the internal left-hand door includes latches. A through-bolt handle slides into a groove delivering closure whilst locking up is attained by attaching a padlock through the catch. Okay, there’s nothing too fancy with regards to features but you can’t expect a flurry of quality add-ons to accompany these bargain prices. When the delivery box is opened you’re presented with a load of lightweight polycarbonate sheets which raise more than a few eyebrows due to their deceiving insubstantial appearance. These require sliding into the aluminium supports prior to making up the framework. Some assemblers breeze through construction, others find it the most frustrating of tasks. Abstain from building when conditions are windy, these featherweight panels are best described as flimsy wobble-boards however once positioned & fastened into place they surprisingly construct into quite robust units. Significant advice is to assemble these lightweight constructions from a solid level platform comprising wood, paving or concrete type substrates which in return eases aligning the panels plumb and determines a perpendicular posture that functions flawless door operations. Also, it’s highly recommended to secure the base down onto underneaths foundations to dramatically beef up their wind resistance. Palram sheds are extremely lightweight, even when constructed. I’ve seen neighbours metal sheds blown down the garden in the past during stormy weather, these are lighter still. Like one guy said, you get what you pay for yet these can deliver the same results as the sturdier alternatives if you adhere to Palram’s assembly recommendations. He prepared the correct foundations for the large 12 ft facility however due to storing scaffolding he opted not to anchor the shed due to accommodating tons of weight. Happy with the appearance and delighted with clearing the landscape, it’s done the job it’s constructed for. Watching this installation video demonstrates a straightforward construction method however some find assembly a piece of cake whereas others clearly struggle. Feedback expresses a diverse 50-50 split regarding style, make-up and assembly. Some accept the seemingly insubstantial lightweight fascia and effectuate Palram’s installation advice, foundations and anchorage to champion a robust inexpensive storage solution whereas others find the make-up & procedure somewhat a disappointment. Although you may be able to cut through polycarbonate, it’s a robust material & described as virtually unbreakable. They construct into sturdy units whilst an elementary clean-down swiftly refreshes their appearance meanwhile this unique opaque/skylight roof configuration is cutting-edge, an envious position to behold. 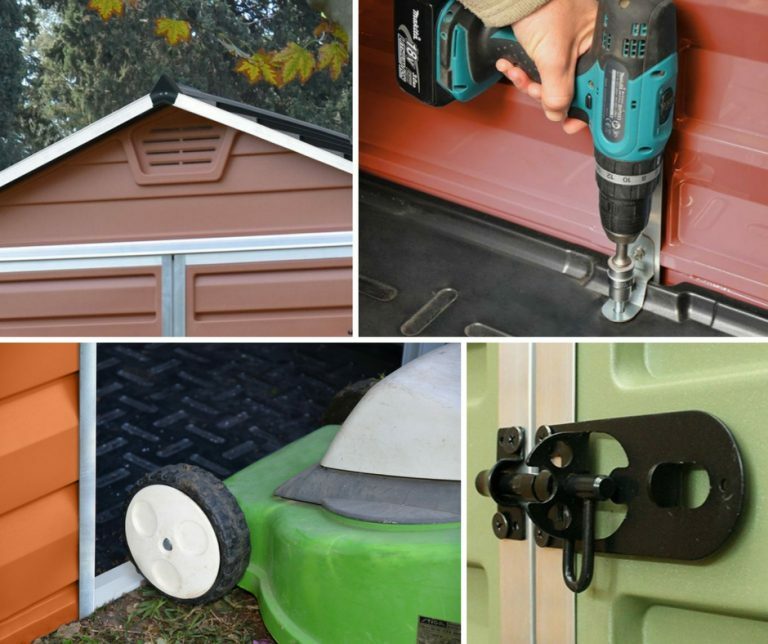 Basic security combines with plain & simple shed features to complement Palram’s inexpensive price. Hope this unbiased Palram shed review thoroughly covers all necessary concerns. Interesting to hear your thoughts on lightweight polycarbonate constructions. Please share these Palram sheds. Thank you. 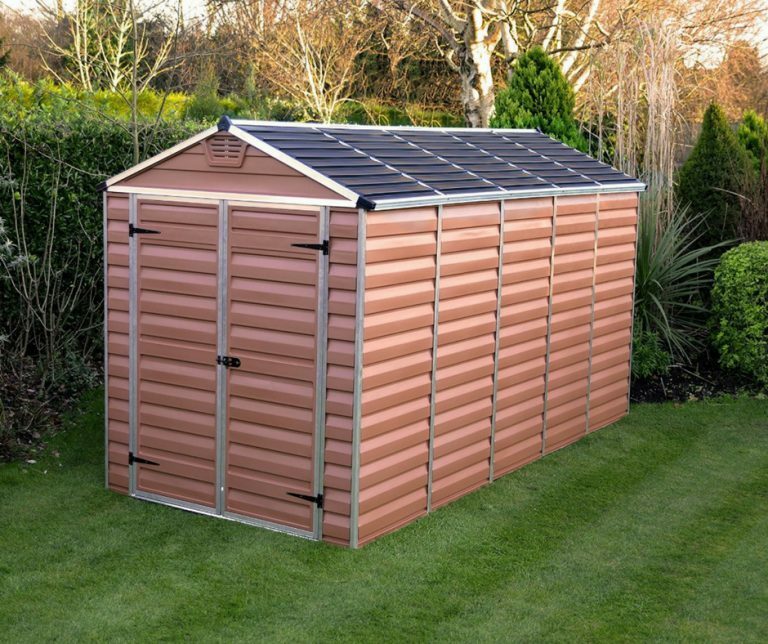 I have always loved going back to your website, simply because I am really wanting a shed for my back yard. You have so many options, seem so knowledgeable, and have a lot of quality sheds presented. I don’t know if I like these particular sheds. I guess I put a lot of stake in reviews, and if they are 50/50, then I am going to move onto some of your others with great reviews. Thanks so much for the informational and honest review! Hi Matt’s Mom, thanks for your kind message, glad you find this wide selection of low-maintenance garden storehouses captivate your interest. 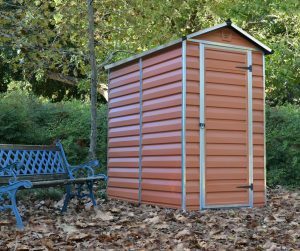 If you’re determined to escape ongoing upkeep duties with regards to rotting panels & re-coats of preservative varnish, there’s shed sizes to suit all circumstances. I try and present all the information honestly with respect to any shed. Palram constructions are hugely popular due to their price tag being half that of competitors however feedback comes across very mixed with regards to construction, manufacture & installation. 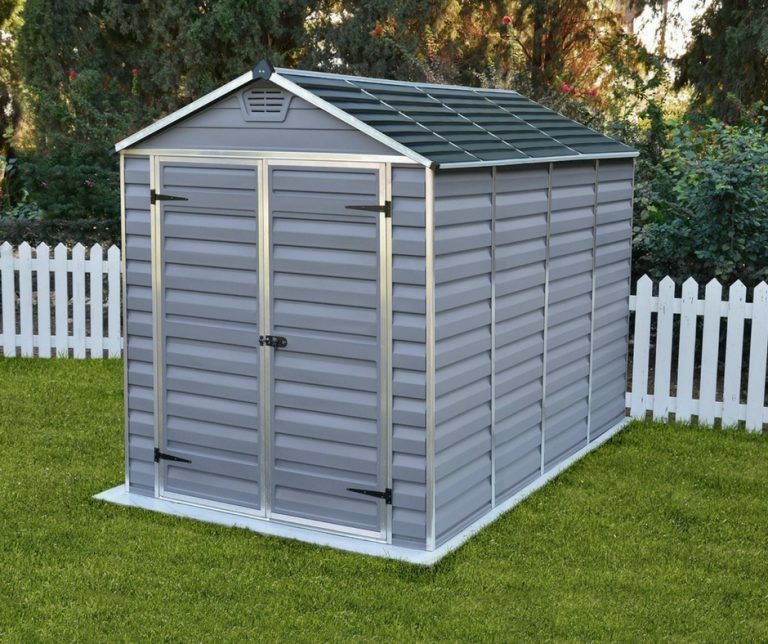 Many people accept polycarbonate is a thin flexible yet robust material that comprises wobbly panels and take advised measures in preparing the correct foundations to station the shed then proceed to build with 2 people, finish off with a sturdy build and find the process okay. Others find the construction too thin and a nightmare to assemble. The satisfied to frustration mix is 50/50 split, there’s no other way of describing it in my view, you either like or dislike them however there’s no doubts this is a pioneering manufacture that comprise features like the entire roof skylight that competitors are unable to compete with, therefore Palram are definitely worth checking out. I’m like you with respect to feedback, I like to read through them as you get a general idea of how the product really serves. 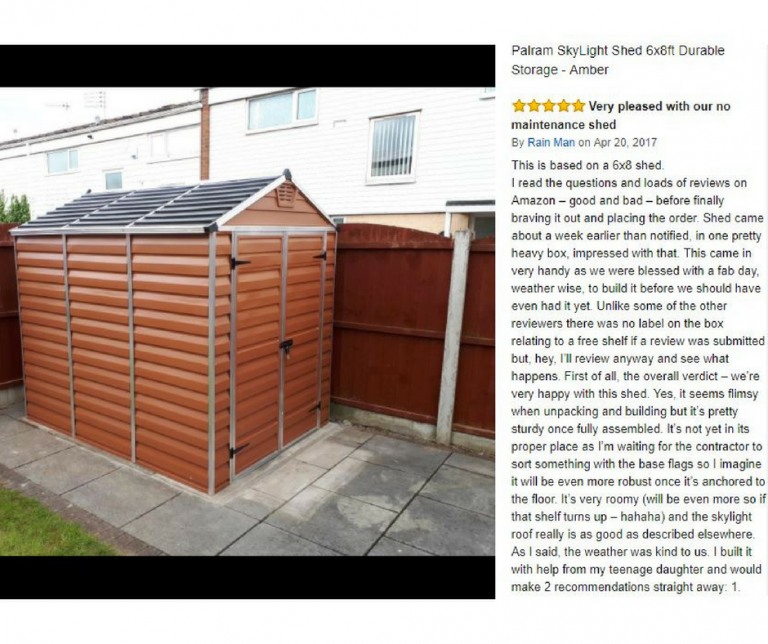 With respect to garden sheds no matter whether wood, resin or metal is chosen, non capture 5 star feedback across the board. My frustrations lie with the sellers because they seldom mention the importance of laying solid level foundations before you purchase, we too found this out after delivery. Although we conformed to the manufacturers foundation advice many people skip the step due to time constraints, however sidestepping these stipulations can lead to many frustrations, the reason I mention their importance in every review I write. Nice, I don’t think I have ever seen plastic shed in real life. I’ve only seen the little playhouses that my friends sister has and they are pretty cool. Thanks for calling in to read about Palram’s budget priced garden sheds. We too were unaware regarding resin manufactures however after years of conservation troubles regarding re-roofing, never ending re-coats of varnish and rotting issues our last wooden shed succumbed to, we opted to look around for an alternative once the time came to replace and were quite impressed with the range of styles available. There’s no doubt that Palram’s polycarbonate make-up is probably the cheapest around due to the single skin & aluminium frame yet it does the purpose they are designed for at a very inexpensive price, fitting most peoples budgets to enable organising their home-yard. Apart from a wash, this composition is practically free from maintenance but very lightweight so it’s essential to implement the advised foundations and anchorage system to maintain their position long term. Yeah, some people breeze through assembly where as others find it the most annoying of tasks due to the flimsy wobbliness of the panels yet once constructed, quite a robust unit comes into fruition.